Typically these blog posts and accompanying videos focus on one area, pose or activity. However this time, I've got an extra special treat for you - a full body yin yoga practice! Every once in a while we need to give ourselves the gift of a long and juicy practice. With these 10 sweet poses you will stretch the hips, hamstrings, quads, low back and shoulders. Set yourself aside a nice chunk of time to get on your mat, and you will walk away ready to conquer whatever comes next. 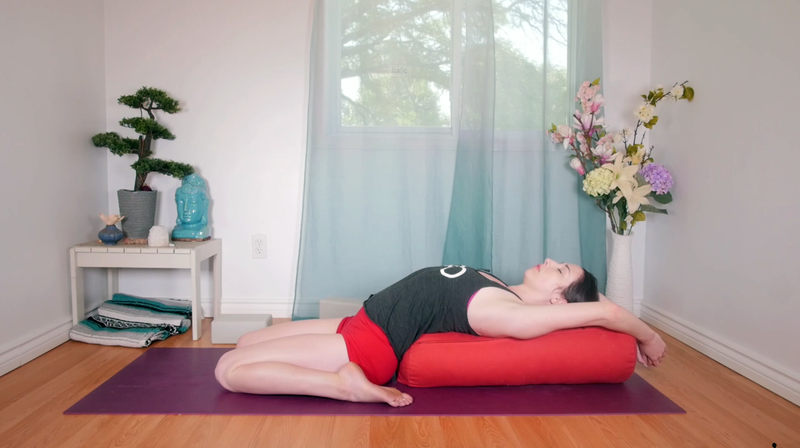 If this is your first time trying some of these poses, you may want to head on over to YouTube and check out my 90 minute Yin Yoga Full Class. Grab some props, a set of blocks and a bolster if you have one (otherwise the blocks will do). Take each pose only to your comfortable edge at first. As you hold these for about 5-8 minutes each, gravity will take your body deeper as it softens and opens up to the pose. Since we have got so many wonderful poses to get to today, I'll keep things brief and let you get stretching! 1. Grounded Meditation - Sit nice and tall, in a comfortable cross-legged position. Rest your palms on the knees and gently close your eyes. Take a moment to find your center by shifting gently side to side and front to back. Find length in the neck, as you let the tension in the jaw go and soften the face. Connect here with your natural breath. Aim to remain present in this moment as you stay in this meditation for 5 minutes or so. 2. Straddle Fold - Still seated, unravel the legs and stretch them long and out to the sides. Inhale to find length in your spine first, and then walk your hands forward to fold directly in the center. Rather than straining to get to the full expression of this pose, use a bolster or blocks to meet you at your edge. In order to avoid hyperextending the legs, keep a soft bend in the knees. As with all of the poses to come in this practice, notice how your body gradually opens more as you hold this, allowing you to take a deeper expression of the pose. 3. Wide-Legged Child's Pose - Coming to hands and knees, take the knees as wide as feels right today and bring the big toes together. Drop the hips back towards the heels, as you start to walk the hands forward and melt your heart down. Keep the shoulders from hiking up to the ears. If you are feeling any uncomfortable sensations in the low back, bring your knees in slightly. Feel free to use props here to support the chest or forehead in this pose. 4. Sphinx Pose - Coming forward, make your way down to the belly. Reach the legs out long behind you, with the toes untucked. Bring the forearms flat to the mat, with your hands to elbows in line with the shoulders. Shine the chest forward, as you lift it away from the mat. This is a bit of a back bend, but if you feel any pinching in the back walk your hands a bit forward. If on the other hand you want a bit more stretch, shift the elbows back. 5. Laying Chest Opener - Remaining here on your stomach, shift the body towards the right edge of the mat. Bring your left arm to the left edge of the mat, with the elbow in line with the shoulder. Bend at the elbow, bringing the arm to a 90 degree angle, palm flat at the front of the mat. With the whole arm staying down on the mat here, start to roll onto your left side from hip to ear. Stack the knees and hug them in towards you. Focus on sending your inhales into the place where you are most feeling this stretch. Gently make your way back to center, taking any small movements you need before switching to the other side. 6. Dragon Pose - From hands and knees, step the right foot between the hands. You may want to bring blocks to set your hands on here. The toes of the back leg should be untucked. Relax the chest and let your hips melt down as you open the hip flexors deeply. 7. Swan Pose - From this low lunge or dragon pose, toe heel your right foot over towards the left. Lowering your right knee behind the right wrist. The right heel will either be closer to the pelvis or behind the left wrist depending how open you are. Wiggle the left leg back a bit further. Slowly walk the hands forward to come down to rest the forehead to a block, the hands or straight to the mat. You may additionally choose to use props under the hips or chest for added support. Keep the hips centered and avoid letting the weight drop to one side or the other. Repeat 6 and 7 on the other side before moving on. 8. Supported Fish or Saddle Pose - From seated, take the legs straight in front of you, or open the knees bringing the feet together in butterfly. Set your bolster lengthwise behind you, or a set of blocks with one vertically between the shoulder blades and the other horizontally supporting the head. Ease your way back to comfortably rest on the props. Turn the palms up and allow the arms to rest at the sides or take them up over head. Alternatively for saddle, come to kneeling. Keeping the knees in line with your hip bones, open the feet to the sides, giving your hips space to shift down to the mat. The heels will be face up and hugging in to the sides. From here the upper body reclines on to the props in the same way as with fish. 9. IT Band Stretch - Reclining onto your back, bend the knees and bring the feet flat to the floor. Lifting your right foot, set the ankle on top of the left thigh. Flex into the right foot and push the right knee away from you. Keeping this figure-four shape with your legs, start to lower your right foot to the left. Setting it flat on the mat, with the right knee pointing up. If the foot doesn't reach all the way to the mat, set a block underneath. Reach the right arm out to the side, to ensure both shoulder blades are pinned to the mat. You may want to grab hold of your right ankle with the left hand for added support. Repeat this on the other side. 10. Savasana - We have made it to the final resting pose. Allow your body to occupy some space as you let the legs reach long and the arms fall at the sides. Melt your body into the floor. Check in with yourself and notice what has changed in your body after these delicious poses. This is your chance to integrate and digest everything that we have done. Surrender. As I said at the top, if you are unfamiliar with these poses, or would like to be guided gently through them, please do click through to the video below. While you're there, please do take a moment to subscribe for new practices every week.